Pastor John Peterson, front left, with Lores Vlaminck, Ecumen of Litchfield’s previous Home Care and Hospice Director. 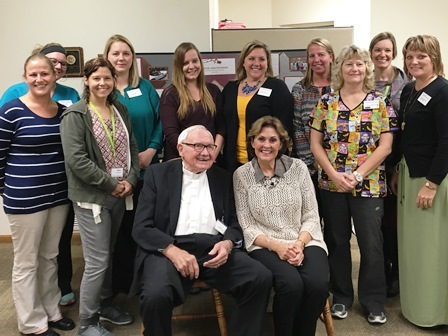 Hospice staff from left to right in rear are Alex Reimer, Kelsey Osterberg, Angie Kinsella, Amanda Becker, Brittany Dobson, Nicole Larson, Sandy Dougherty, Shelly Hank, Jill Johnson, and Judy Loecken. We had a party in his honor on October 11. 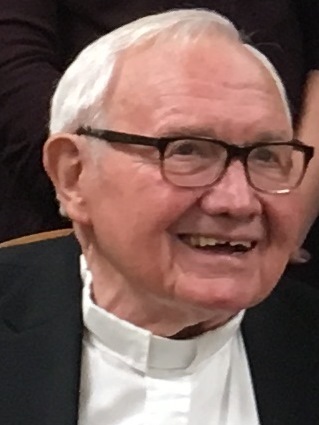 About 75 people attended to celebrate his dedication to the hospice program. Friends, family members he had touched and past workers were in the group, and we reminisced about his time with us. One of Pastor John’s most lovable traits is his ability to minister without judgment. He meets people where theyare and affirms — no matter what their beliefs — that they are loved and their life has purpose. Once when he visited a Jewish client, she bluntly asked him why he was there. “We share the Old Testament,” he responded. She asked him to officiate at her burial. He has an ongoing relationship with a self-professed atheist, who continues to welcome Pastor John’s visits and their discussions about scripture. Pastor John has a special way being where he is needed, when he is needed. He once drove 30 miles one way to pick up the spouse of a client so she could be with him in his final hours. On another occasion, one of our nurses was with a client and realized he was in his final hours. The family wanted to call the primary pastor, but knew it would be a while before she could get there. As a discussion about what to do ensued, there was a knock on the door. There was Pastor John ready to minister to this family. Every other Friday, we hold a hospice staff meeting. Often we would start with Pastor John saying a prayer, then move on to discussion and updates on each hospice client. Sometimes tears could be seen around the room as he would explain how clients were struggling with their end of life journey or having a spiritual crisis.